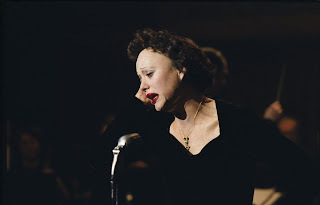 Some films sort of sneak up on you - while I had obviously heard of singer Édith Piaf before watching Olivier Dahan's La môme (2007) and while I was aware that, despite her remarkable voice, nearly everything she sang sounded very, very depressing, I had not the first clue concerning the extraordinary life led by one of France's all-time divas. And so it was that I settled in for an evening with Édith and, thanks to the remarkable performance from Marion Cotillard (which combines tenderness with snarling savagery, and which deservedley won her the 2007 Best Actress Oscar) and the remarkable sincerity of Dahan as director and co-writer, along with Isabelle Sobelman, I was by turns intrigued, amused, moved and ultimately transfixed by the rags-riches-rags-riches story of a woman who lived so intensely every day of her life. Dahan, whose previous work such as La vie promise (Ghost River) (2002) and Le petit poucet (Tom Thumb) (2001) only hinted at his range, presents a non-chronological look at the life of 'The Little Sparrow', Édith Piaf (1915-1963). Born to an alcoholic street singer with her father a circus performer and her paternal grandmother a brothel madam, Piaf was discovered at 20 by club owner Louis Leplée (Gérard Depardieu) who was murdered, then coached by a musician who introduced her to concert halls, with fame following quickly. But her life's only true constant companions are alcohol and heartache, with the tragedies of her love affair with Marcel Cerdan (Jean-Pierre Martins) and the death of her only child belie the words of her signature song, Non, je ne regrette rien. Piaf's overwhelming sadness, coupled with her defiance of life's injustices, have been absolutely nailed by Cotillard - rarely, if ever, has there been a biopic so ultimately life-affirming, so ultimately tragic. Absolutely, one for the ages. 140 mins. In French and English.